We have released a new version of Code to FlowChart, which allows user to try the XML exporting functions with the free trial. As you maybe know, we have included the XML exporting function in Code to FlowChart v1.5. But there was a limitation: only registered user can export flowchart or NS chart to XML file format. In Code to FlowChart v1.5.1, we allow all the users to try XML exporting function. The only thing is, you need to wait 8 seconds when you prepare to export the flowchart as XML file. The XML exporting function was suggested by one of our users (thanks to him). If you have any question or suggestion, please don’t be hesitated to let us know. Once your suggestion has been adopted, a considerable discount coupon will be sent to your mail box! BTW, Code to FlowChart is in our Christmas Special Offer now. You can save as much as $30 from the normal price of personal license. 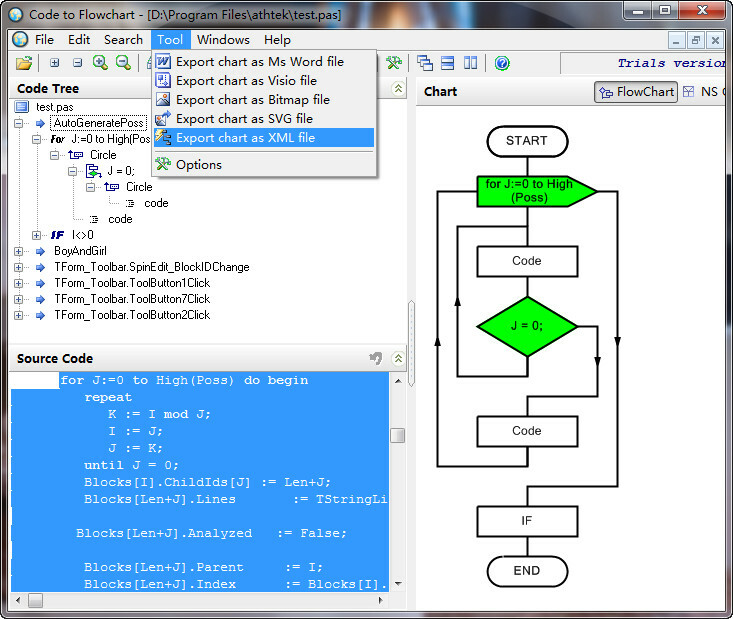 We are planning to include a interactive coding function in the next year 2012. By then we possibly raise the price of Code to FlowChart to more than $200. If you are in need of our Code to FlowChart, the Christmas Special Offer is the chance you should never miss!